Whisk together lemon zest, lemon juice and olive oil. Place spices in a small skillet and heat to medium-high. Toast the spices, stirring constantly, until fragrant. Whisk the toasted spices in the bowl with lemon and olive oil to make a marinade. Thinly slice chicken thighs and combine with the marinade. Refrigerate for at least 30 minutes to overnight (the longer, the better). When ready to roast the chicken, preheat oven to 425°F. Remove chicken from the marinade and place on a greased baking sheet. Roast for 16-18 minutes, until chicken is fully cooked and starting to crisp on the edges. While chicken roasts, prepare hummus. In a food processor, combine garbanzo beans, tahini, garlic, lemon zest and juice, a pinch of salt, pepper and paprika. Place the lid on the food processor and pulse while slowly drizzling in the olive oil. Continue until hummus is smooth. Add more oil, if necessary. Taste and adjust seasonings. (I like a lot of lemon juice and garlic!) 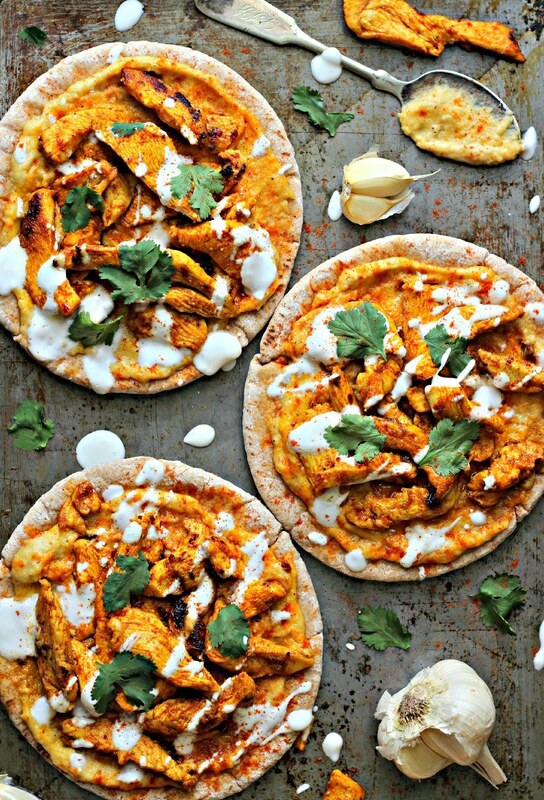 Spread hummus on toasted pita bread and top with chicken and desired toppings. Enjoy!